It's publish-time again. You can feel the dread of the deadline approaching. Consistently pumping quality articles to meet the endless demand of your content hungry audience can be stressful at best. 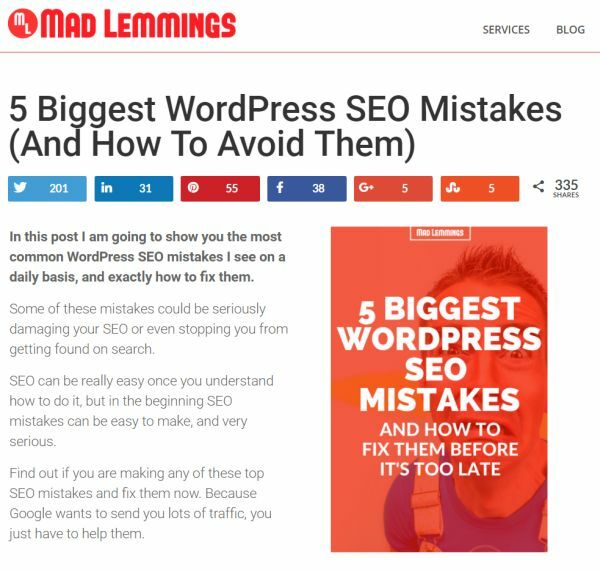 Thankfully, there's an article format that's quick to write and can result in massive engagement when done properly: the list post. What is a list post, you may ask: any article built around a list of points is called a list post, or a listicle. Content writers all over the internet have adapted it as their go-to format. 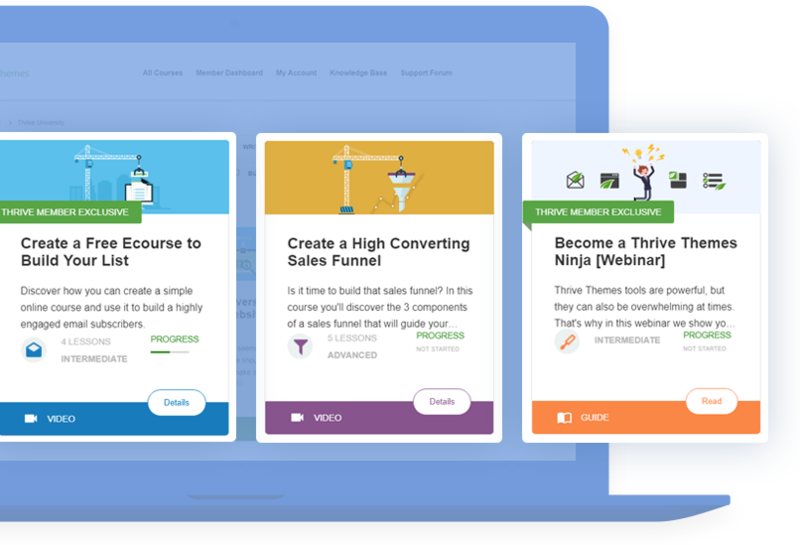 Regardless of your niche, this type of article allows you to write quick content that can drive a ton of traffic to your website. It's quick to write, it's fun to read, and a properly executed list post has great potential to go viral. Most list posts out there end up as useless filler that no one ever talks about. Let's make sure you don't become one of them. 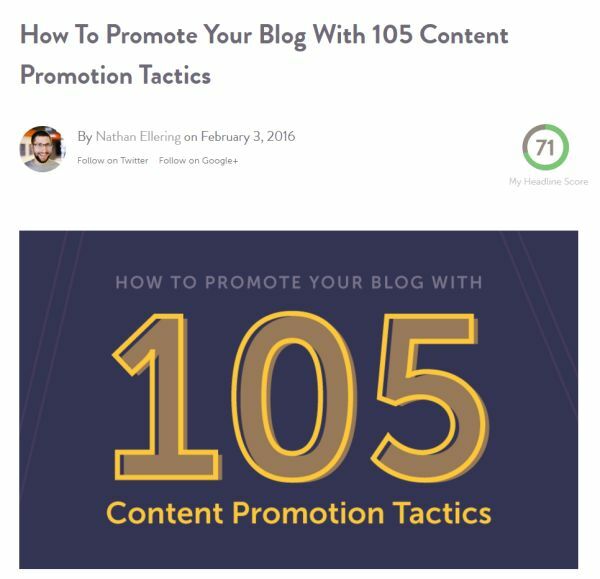 Let's make sure you can write amazing list posts quickly and every time. The clear list format is the key to write listicles, which has been the bread and butter of bloggers since the dawn of blogging, but why? They're quick to write. As writers, all we need to do is brainstorm around a topic, create a bullet point list and flesh it out. They're quick to read. As readers, knowing the number of points gives us an idea of the amount of time we need to invest into reading. They're scannable. Most of us don't have the time or interest to get deeply invested into articles. A scannable list of points improves readability and offers your reader a chance to quickly find what they need. They're fuel for going viral. For the above reasons, list posts are the most shareable articles on social media. 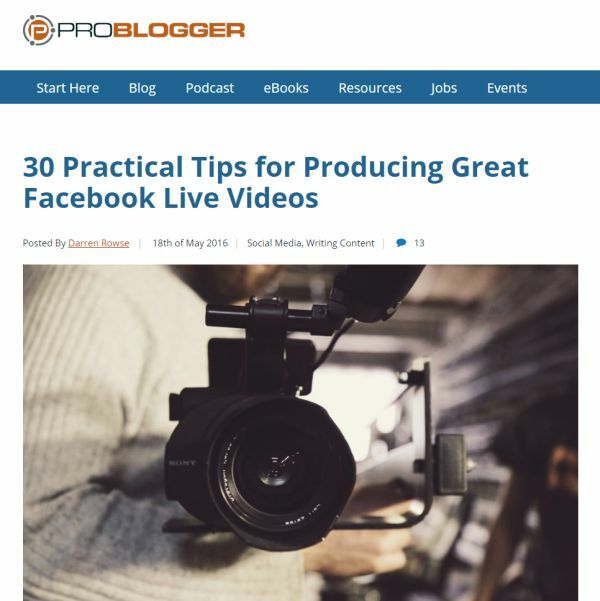 Notice the simple, yet functional headline "30 Practical Tips for Producing Great Facebook Live Videos" and compelling introduction. These capture our attention and lead us to 30 points fully fleshed out and detailed with practical examples and action points. A detailed list post is highly effective and can lead to incredible results, but it takes a lot of effort to create. If you don't feel like putting effort into tens of points, don't write about tens of points. 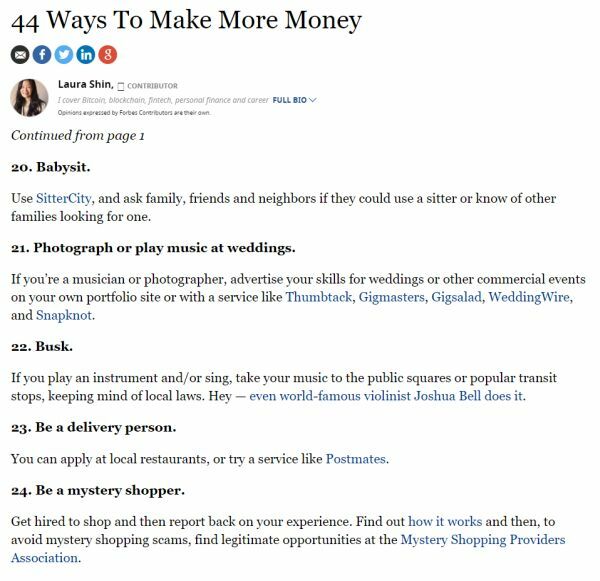 Otherwise you might end up like Laura Shin at Forbes, with her 44 points about making money. This article boasts an impressive amount of list points, which undoubtedly attracts easy clicks. 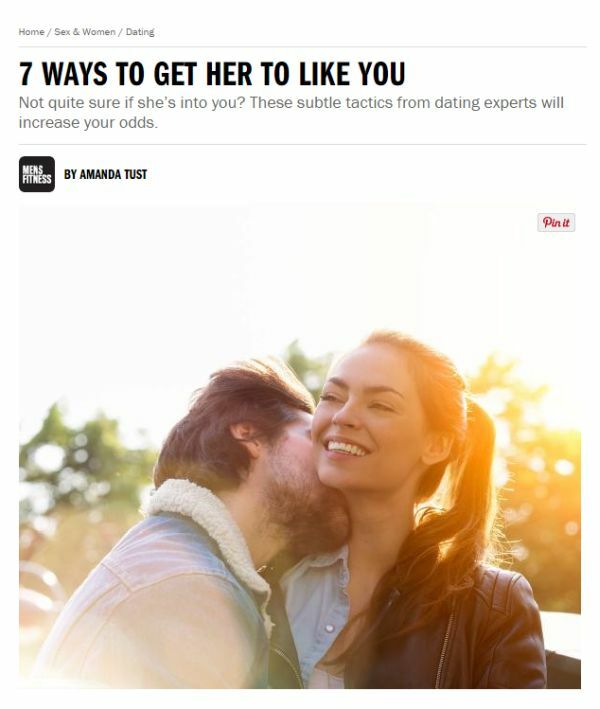 Unfortunately, you only need to take a look at the article to realize how shallow it is. It's got a nice little introduction, and the first couple of points seem interesting, but soon after it turns into rehashed filler. Creating a clickbait introduction, then not delivering on promises is always a disappointment to your reader. Forbes may be a bit lazy at times, but it's nothing compared to Buzzfeed - the kings and queens of fluff content. The author of this post didn't even bother to write an intro. It's nothing more than a list of images. 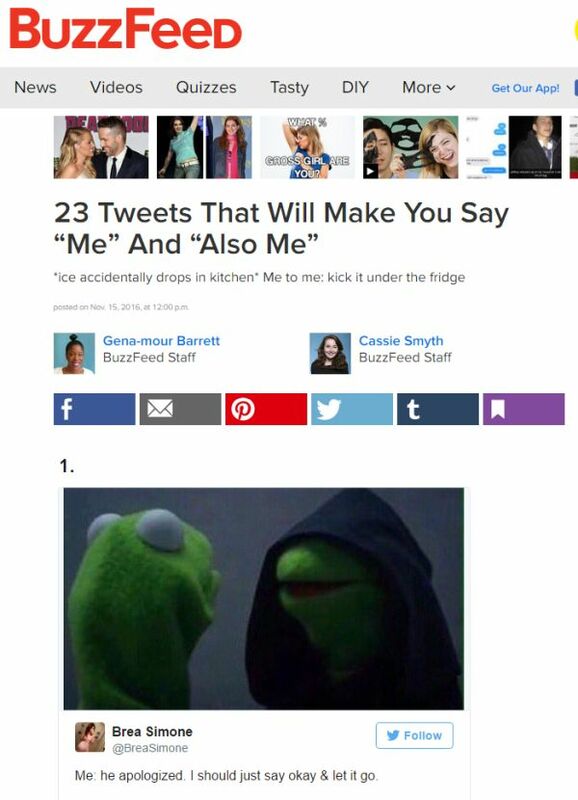 I realize Buzzfeed is the place where procrastination is born, but c'mon now. This is embarrassing. Most ill-performing list posts have a common downfall. They're not articles at all, but simply .. lists. Even the simplest list post needs some fundamental pieces to be successful. While your reader isn't necessarily looking for a writing masterpiece, they're also not looking for a shopping list. Here's eight things your list post must include to have the best chance of going viral. You need a great headline. 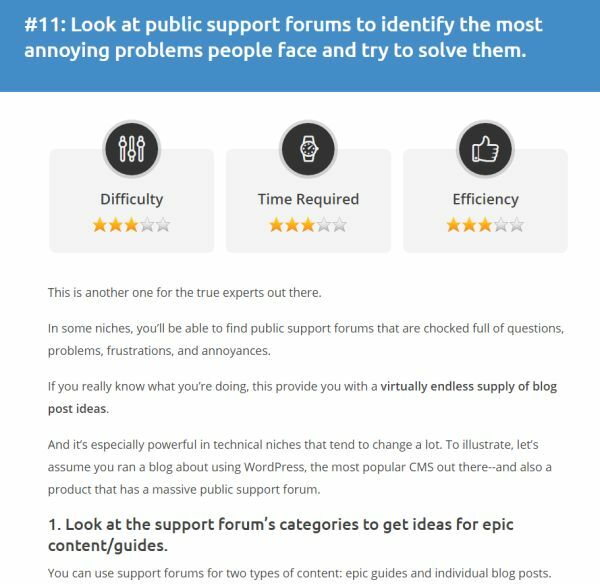 The reader of a list post is looking for quick tidbits of information to quickly provide a solution to whatever problem they're battling with. The basic list post headline​ is adequately functional for most purposes. This works and you can go all your life creating content using only this headline template, but a truly killer list post takes it a step further. 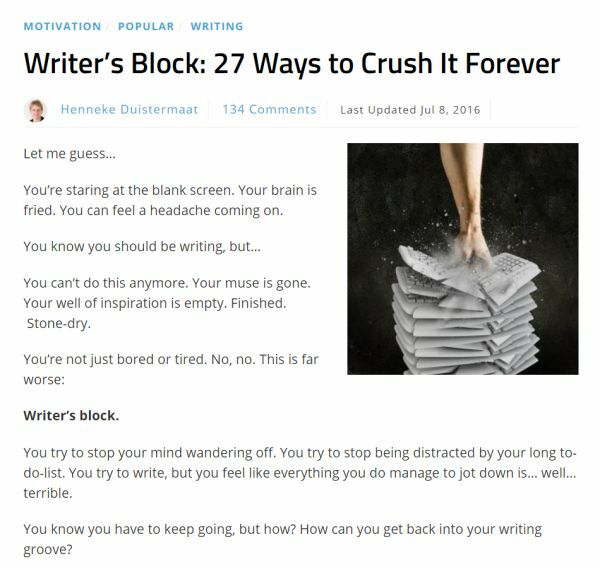 In this Smartblogger post﻿, Henneke could've gone with a basic "27 Ways to Crush Writer's Block," but just with a clever word choice she spices up the headline from good to great. As readers, we click articles to find a specific solution to whatever problem we might have. Before reading the article and taking any pointers as solutions, we want to be sure the author truly understands our situation, which feels unique to us. Before blasting your reader with a list of pointers, you need to catch their attention with a compelling introduction that shows you understand and relate to their situation. Writing a compelling article introduction takes practice. Here's a few quick guidelines from Writers in Charge​. Your list post is not a shopping list. You must organize your pointers points in a way that makes them flow from one to the next. ​While all the points (should) relate to the same topic, they can't be arranged in just any order. 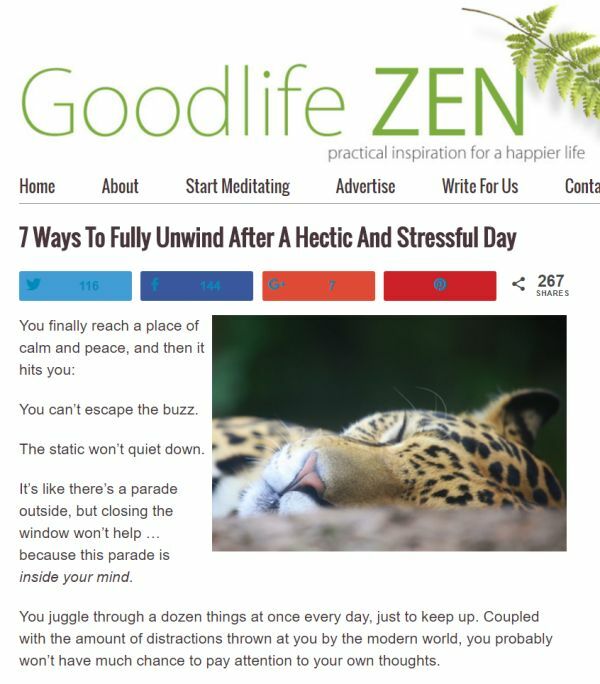 Here's a list post on Goodlife ZEN about unwinding, written by yours truly. Relieving stress and relaxing are intangible concepts at best, so you might wonder how can you arrange those points into a logical order. You're right. There's no clear way or simple answer on how to order list points, but there's always a natural order. In my post on GLZ, I arranged those points ​in order of difficulty. It seemed natural. Order of importance. Is one item funnier, more surprising, more important, to your post? Place it first. Order of timeline. Should your reader try something simple first, before moving on to something more drastic? Order of scale, size, temperature or other measurement. Small to big, hot to cold, light to heavyweight are all good ways to order list points. Logical / incremental order. Your list points may each build up on one or more of the previous ones. Always arrange your list. It's much easier to follow and opens the possibility for easy sharing. It seems to be a trend among list posts to include a massive amount of points. Sure, it sounds impressive to include 150 points in your X ways-article, but it comes with a huge caveat. Most people include list points without providing good information to back them up. A huge killer in list posts is listing nothing but shallow, useless fluff. While your readers are looking for a quick list of tips, they also want a thorough answer to whatever question they might have. Here's Gael from Authority Hacker showing us how to go deep on every point. This post has 11 sections, all extremely detailed, readable, and scannable. ​Introduce the point. What are you talking about? Give an example solution, perhaps with an image or previous use case from someone else. Give an action tip. What can your reader do immediately after reading? If you can't provide usable information on a point, just leave it out! It's always better to have 10 thoroughly detailed points with practical advice, than 100 points that provide nothing of value. The main reason for a list post reader to click on your article is that list posts are easy to digest. In your reader's mind, they are getting a certain number of points, so they only need to commit their attention for a certain amount of time. Since it's fundamentally a quick read-article, it must be scannable. 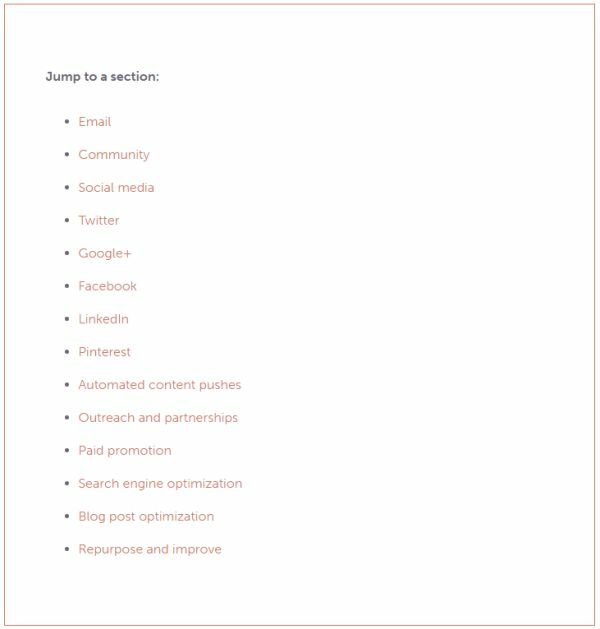 When your visitor arrives at your article, expecting a quick read or easy list structure, the last thing they want to see is an almost invisible "NEXT"-button. No, most visitors will rather go for the Back-button or Close Tab-button in their browser. Numbered list points. This one is essential. 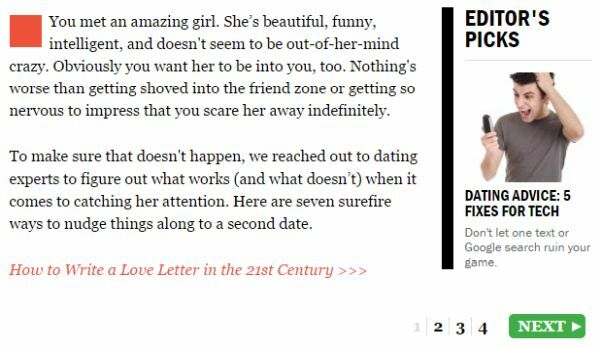 If you're writing about 11 things, make sure those 11 things can be found, otherwise your article will look like this one. Consistent structure with H1-H4 headings and paragraphs. Not only is this good for SEO, but it's easy for our brain to understand different sections like this. Consistent formatting. Write your paragraphs and headings with consistent font sizes and styles. Consistent visual style. If you include an image in one list point, make sure to include it (or a similar graphic) in every list point. As you see, good scannability comes from a logical and consistent structure in your post. Make your article a reading pleasure. The list post is a fun format because it's so flexible. Some list posts are quick reads with ten tips. Others have a massive amount of list points, each with incredible detail and practical advice. When your article starts looking like a massive encyclopedia of value, it turns from list post into ultimate guide, or "skyscraper post." These skyscraper posts are great for attracting attention and backlinks, but you need to be careful with your presentation. CoSchedule's blog is turning into a collection of skyscraper posts, each with massive amounts of knowledge. Here you see Nathan Ellering's list post with 105 techniques, each with a detailed instruction to go along with it. Nathan has not only divided the list points into clear subsections, but also included a handy table of contents. This makes the huge article easy to navigate. If you have more than 20 list points, consider dividing them into sections with a clear table of contents. If you're able to take a mundane topic and provide a surprising angle to it, people are more likely to be interested. This classic truth also applies to your list points. 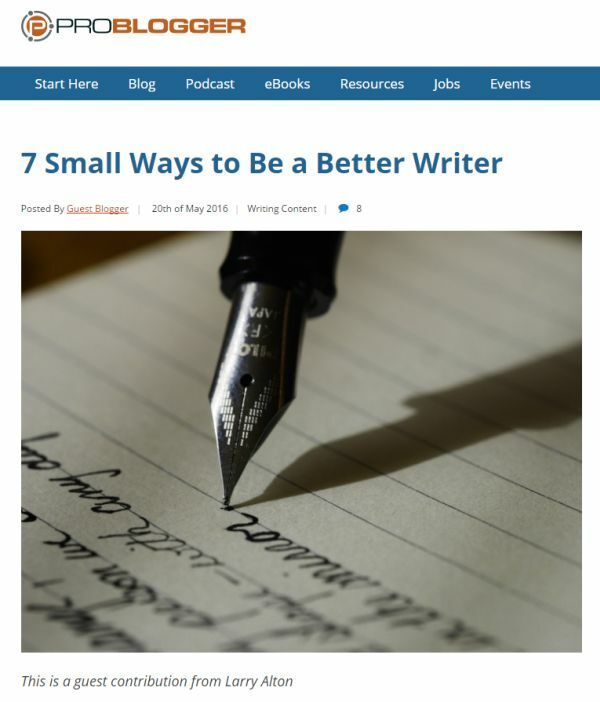 Here's Larry Alton with a list of tips on improving your writing. Instead of beating you up with tough love-tips, you find tips like "Watch a lot of TV and movies." Watch a lot of movies to be a better writer? Hey, sign me up! He's practically giving you permission to slack off and still be a good writer. He goes on to detail the point though - you need to watch a lot of movies, but only to keep a close eye on technique and execution.​ These are valuable skills you can implement into your own writing. This point will likely stick in my mind because of its uniqueness from other writing tips. And I'll take any justification to watch more movies. Include a completely new point. Include all the popular points, but do some extra research to find something completely new. Something no one else has thought of. This minor extra effort on your part is a great way to separate you from the pack. Turn an existing popular point around. Imagine you're writing an article about ten dieting tips. Most popular articles would probably tell you to stop eating chocolate. What if you made a point that explicitly told you to eat chocolate to lose weight? Obviously you would need to make this point work for your narrative. For example: Instead of stopping chocolate entirely, allow yourself a couple of bits once a week. That will keep the rebellious urges at bay. Lastly, remember to ask your readers for whatever they would add to your list. It's a great way to engage your readers in conversation and to show that you might not have all the answers. The writer is, after all, a fallible human being and can not know every single point they're trying to make. Content marketing doesn't have to be a chore. Gain doesn't always require pain. Choose a topic for your list post. Brainstorm the best points you want to include in your post. Pick out the best 5-10 points you want to talk about. Organize the points into a good flow. Write your intro and call to action. That'll give you great content and you'll never have to scratch your head about what to write again! Did you know that you can spice up your listicles by using the styled list feature in Thrive Architect? If you are unsure on how to get started, check out this quick start tutorial. What would you add to this list? What are the things you always include in your list posts? Nice post with some valuable information. As my blog is all about lists, I’ll certainly take a lot of these points on board. While I am yet to find my style, I certainly agree that presentation is everything. It’s something I’m working hard on to improve. Question – Here’s nine things your list post must have to… I only read eight! Was this to find out who pays attention or a genuine oversight? Thanks! I’m sure your list posts will be marvelous. You’ll be fine with a simple presentation. Don’t worry about complicated styling. It’s all about clarity. One mistake I made during the creation of my website was not building my list from the start, now it is almost a pivotal aspect of my site business that I immediately setup. While this comment has nothing to do with list posts, I appreciate your input, Jeremy. Great post Jay! It is easier said than done, but I’ll give it a try! Thanks! You’re welcome! Thanks for reading. It’s never going to be easy, but I hope this made it at least easier. This depends on the purpose of the post. In some cases, the length IS the value of the list. For instance, if I’m looking for “quick and easy weeknight suppers,” I don’t really care if the author tells me all about each one (in fact, I probably don’t want him to waste my time) — all I really need is a recipe link. But more is better (assuming, of course, a minimum standard so we’re not talking about just JUNK links). I feel the same way about “uses for ______” posts. They can be short in terms of number but more filled out, but they can also be long lists of brief descriptions, whose purpose is to get the reader’s own creative juices flowing. So whether you need fewer points but to really flesh them out, or more points and not to worry with fleshing them out, depends on the problem you’re trying to solve. It was fun to see one of my blogs, GoodlifeZEN featured in this post! I think a quality list post is a lot of work… but worth it. One way to get a lot of traffic is to curate other top posts. For example, I get a whoosh of daily traffic for a post on WritetoDone.com, called “How to Write With Confidence: 10 Superb Articles “. Each of the 10 points is about one of the articles with a description and quotes. 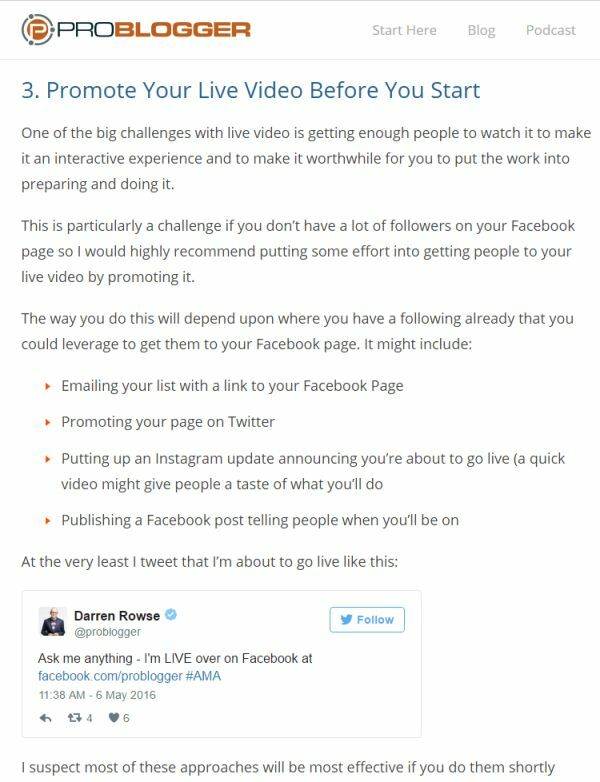 This kind of list post is easy to put together – and you get a lot of social media traffic because you can get the people you feature to boost the post. Such great points, thank you! I agree that so many list posts are lazy and don’t add value, but the good ones are gold, and I keep them to refer back to time and again – like this one! Write a list is way faster than a long well written article and often meet more success, this is frustrating. Don’t forget, the best list post is also well written and researched. 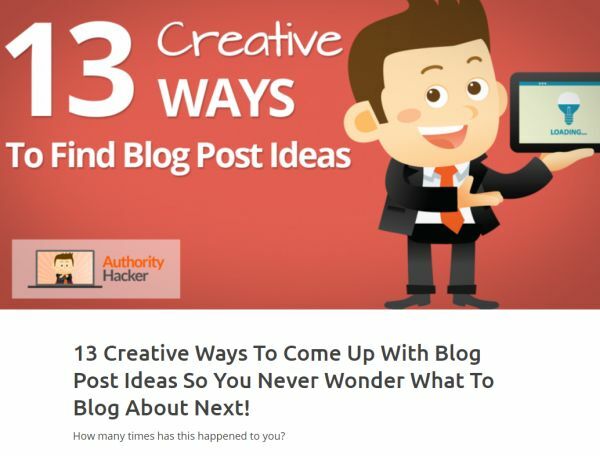 Write a list post is easy to read and memorize. It is Such great points to be shared with us, thank you! Excellent text, I also agree to make lists, I think it makes organizing easier. You have great information in your text. Such a valuable piece of information you have provided! Many thanks.